In this article we'll show you one interesting approach which we discovered recently: we call it "surrogate attributes". It speeds up the performance of many calculated measures, especially those which run through dimension members of the lowest granularity level. You may find that this measure is artificial. 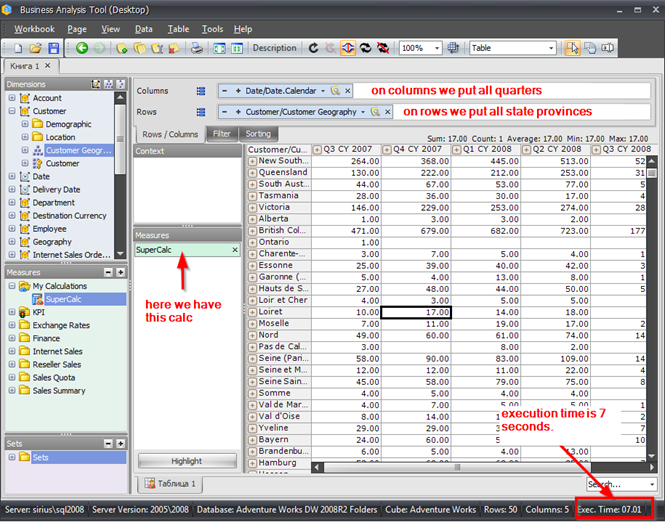 Yes, it is: I've done this measure on Adventure Works database just to demonstrate the approach. The goal is to calculate something by running on low-level objects. In this example we need to find out how many orders made those customers whose quantity of ordered products is more than 2.
we'll get 7 seconds execution. Unfortunately, there is no way to tell to the MSAS "please, read all the measuregroup into memory because you will need it WHOLE later." There is no such MDX or XMLA command. So, what shall we do in this case? The answer is next: we need to improve our formula AND to add one trick to the dimension. The construct "SUM(FILTER(set, condition), measure)" is a very ineffective one, and it should be replaced with "SUM(set, IIF(condition, measure, null))" to allow block evaluation working. We can stop out optimization efforts, of course. 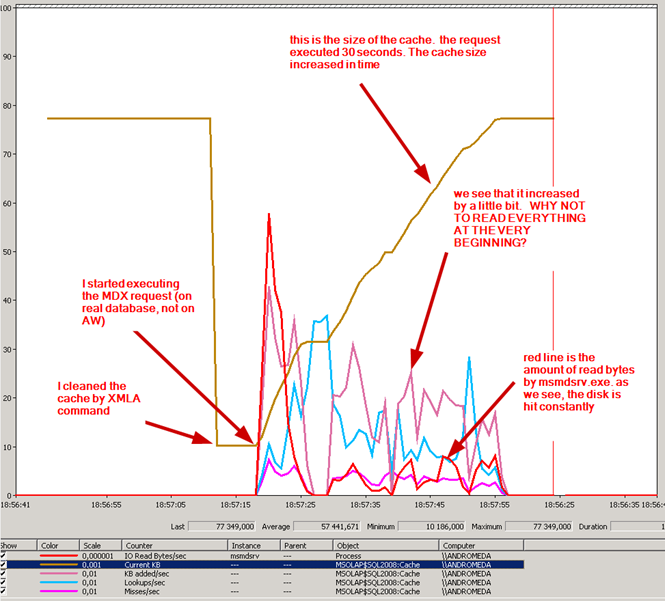 But this is not enough: we run 159 storage engine queries instead of one, and I still don't like it. is different. But how can we make so that this set is the same for every cell? But for all those customers who do not belong to British Columbia, such tuples will automatically evaluate to null, because attributes "State-Province" and "Customer Surr" are INDEPENDENT on each other. If you used the real dimension key (instead of surrogates) in the formula, then IT WOULD NOT EVALUATE TO NULL, because real key "vanishes" the British Columbia (because the "State-Province" is dependent on the real key). That is why real key attribute doesn't suit us. We optimized everything from 7.6 seconds to 179 milliseconds – in 42.4 times, and we COULD STOP on this, but we did not. Instead, we made one more optimization – from 179 milliseconds to 25 milliseconds, that is in 7.16 more times. On this example with Adventure Works this may seem as "not important". 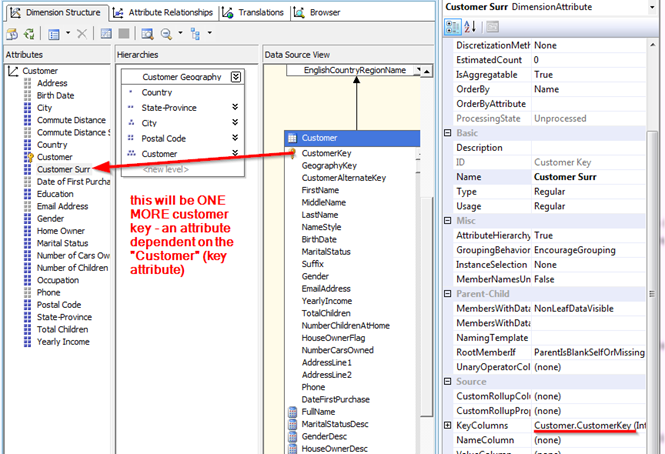 But believe me, on real huge databases this plays a big role. From now we try to make surrogate attributes every time in every dimension, and we always consider using them instead of real keys in all calculations where we have enumeration of the values.